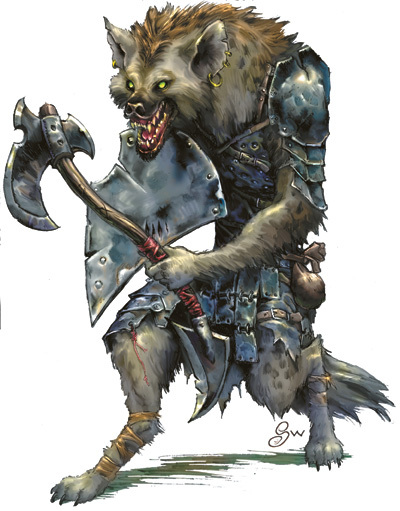 AD&D intoduced us to the Gnoll we all know and love today. The term itself can be traced to earlier works, including 1974’s OD&D, but the familiar hyena humanoid came to us with first edition. 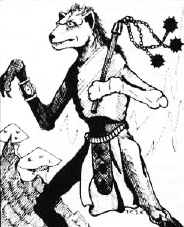 AD&D also brought in a subspecies of Gnoll, the Flind. The best way to describe their relation is to compare them to real world chimpanzees and bonobos. In game, they had an odder relationship, with the smaller Flinds acting as leaders to the Gnolls. Interestingly, while Gnolls loved the Flinds, the feeling was not reciprocated. Presented in the Monster Manual and Fiend Folio respectively, they were a new creation with little supporting background initially. AD&D was surprisingly supportive to Gnolls, with material in Dragon #63. This edition established the link to Yeenoghu, and identified him as a Demon Lord. This was in the Monster Manual, and followed up with in Dragon #63. The Dragon issue also expanded on the “culture” of Gnolls. I use the term loosely, because they were, by and large, presented as another lazy and evil monster race that hated everything, worshiped demons, and so on. Dragon Magazine did add a new variant of the Gnoll however, in issue #89. The Ghuuna was a larger than normal Gnoll that could transform into a hyaenodon via a form of lycanthropy. 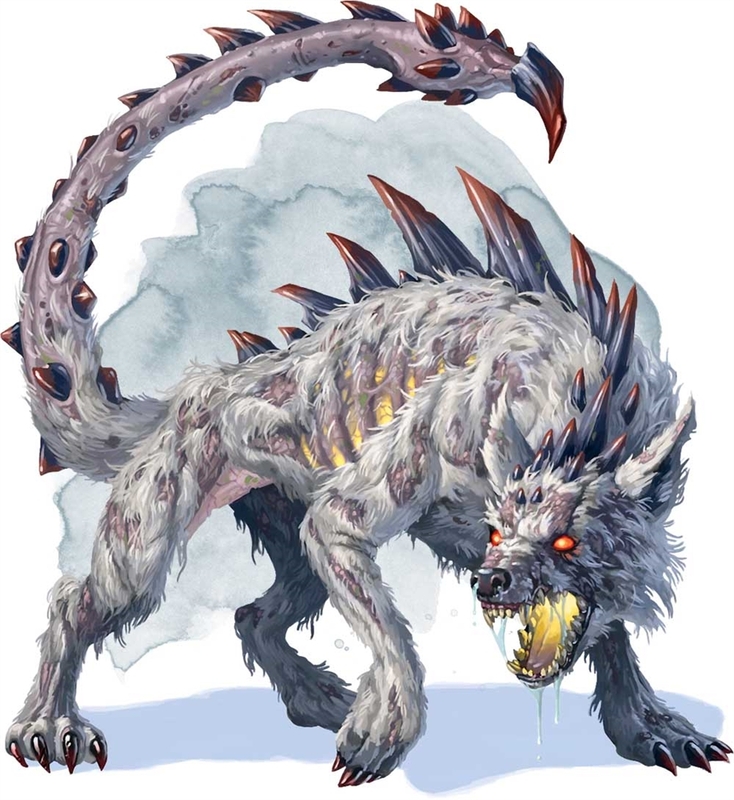 Unfortunately for most, the Ghuuna was largely lost to the D&D community and omitted from future editions. 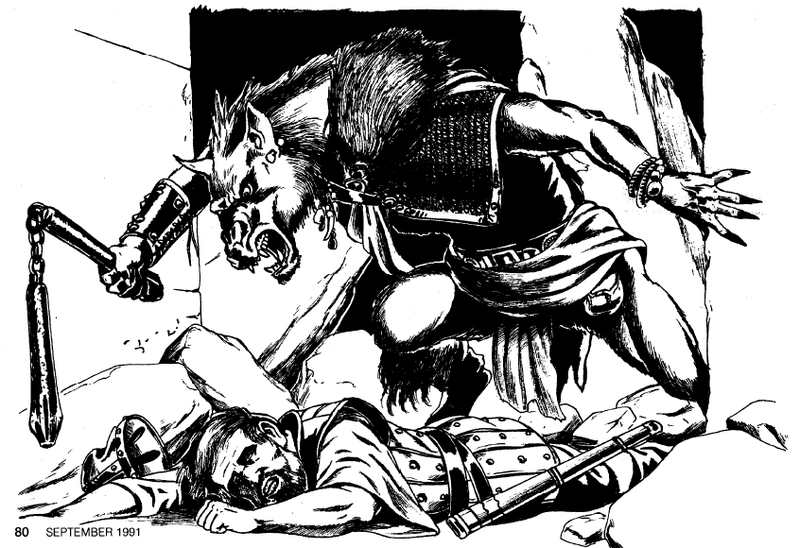 2e AD&D kept the Gnoll and the Flind, dropped the Ghuuna, and made some discreet changes to the magic mix. 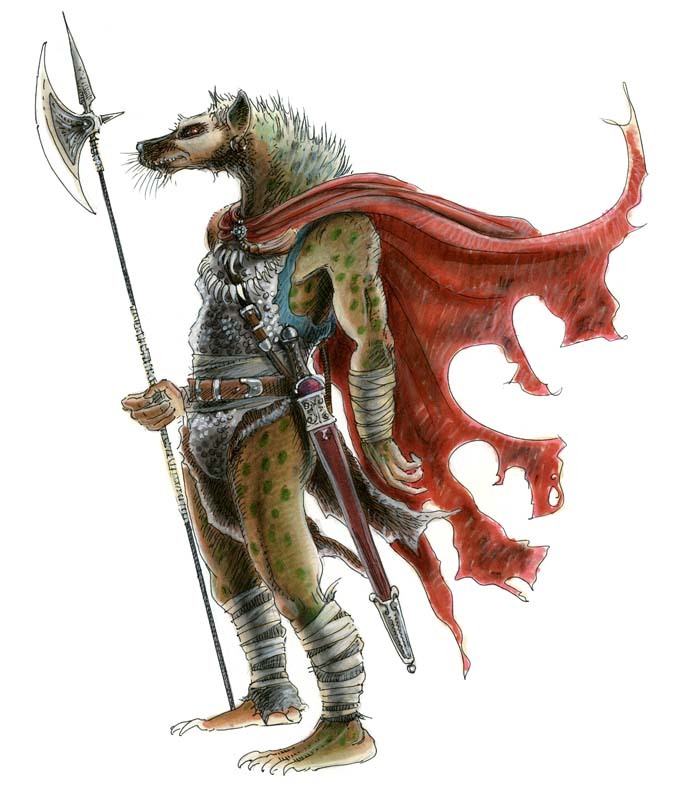 Flinds were never depicted, and Gnolls underwent a shift from hyena-featured human in 1e AD&D to anthropomorphic hyena-man. Gnolls and Flinds were also presented as playable character races in the Complete Book of Humanoids and in the Player’s Option: Skills and Powers books. Unfortunately, like all non-humans who weren’t “pretty”, they suffered from serious level caps and class restrictions that made homebrew mandatory to make they viable for long term play. 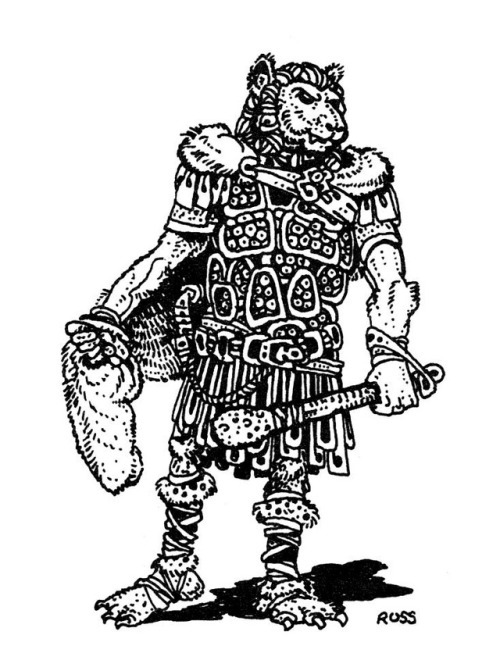 Gnoll “culture”, and I use that term loosely, was greatly expanded in 2e AD&D in Dragon #187. The magazine went deep into the “sociology” of Gnolls and Flinds, working hard to attempt to hybridize animal social behaviours with those of sentient/sapient beings. The attempt was somewhat successful, but Gnolls and Flinds were clearly suffering from the non-functional and counter to long term success cultural designs that have been an issue in D&D around non-humans since day one. Dragon #187 was also the first time that they were depicted with digitigrade legs. (not pictured in 2e AD&D), was changed from a demon lord into a lesser god that dwelled in one of the less nice parts of the Abyss. The reason for this was simple. 2e AD&D was designed to be “Mom Friendly” in the aftermath of the Satanic Panic of the 1980’s. Anything demonic or devil related was scrubbed and got a new coat of paint. This shift was covered in the Monster Mythology book, but aside from that, things remained largely status quo. Gnolls and Flinds almost exclusively worshiped Yeenoghu, and their origin remained largely “demonic” in their narrative coding. This was the effective sum of support for Gnolls in second edition, along with a few appearances in novels. 3e and 3.5e D&D saw serious changes to Gnolls and Flinds. They both became more bestial, and the Flind in particular shed their much of their previous feel in favour of a mid-boss vibe with a less intellectual, more brutal outlook. Gnolls and Flinds appeared in Monster Manual and Monster Manual III respectively. Gnolls and Flinds were now well established monsters in the game, however, they were still lacking good context and placement in the monster ecology, as they overlapped with goblinoids, Orcs, and to a lesser extent, demons. They were familiar to long time players and DM’s, but still didn’t “fit” well in many ways, and their confused portrayal in novels from the TSR era spoke to this. That situation changed with the release of two books. The Grand History of the Realms, and Races of the Wild. These books gave them a deeper history, and made them not only more viable as player characters, but also fit them into the larger monster ecology with reduced overlap. The key factor was that these books revealed that Yeenoghu was not only not their creator (something established in Monster Mythology), but that there were tribes of Gnolls and Flinds who were free of his influence and a natural part of the world they were in. Narratively speaking, it represented a huge leap forward, the sort of thing generally only reserved for “popular” monsters like Orcs and Drow. This edition saw a lot of shifts in a lot of places, and fundamentally altered many aspects of the game. Gnolls were no exception. Flinds were dropped completely, and Gnolls were brought into format to match the altered mechanics of the game. Narrative wise, they remained consistent with the previous edition. 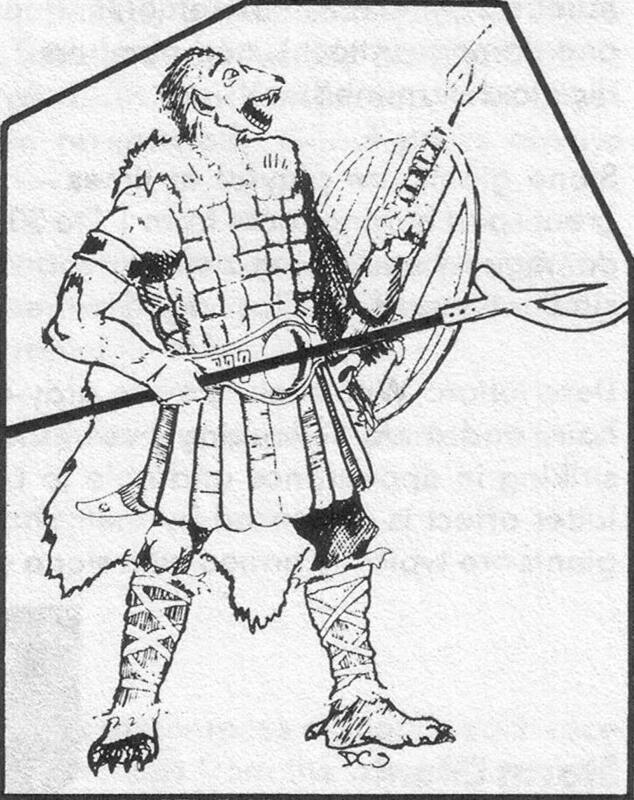 Options to play as a Gnoll were offered in Dragon #367, and included edition specific modifications. Gnolls and Flinds return in the latest edition (at the time of writing), in the Monster Manual and Volo’s Guide to Monsters respectively. However, their previous origin had been heavily modified. The nuance and narrative options were absent, and they are back to being a throw away “I feel like not having the players fight Orcs tonight” monster. Their demonic origin is back, and double down on, with the fluff for them emphasizing over and over about how heartless, ruthless, and utterly devoid of empathy and capability for building complex or stable society they are. Volo’s Guide to Monsters reinforces this concept by expressly focusing on the Gnoll War Band and the unnatural way that Gnolls and Flinds come into being. Like some many other things in the current edition, it very much appears to be a one step forward, two steps back situation. 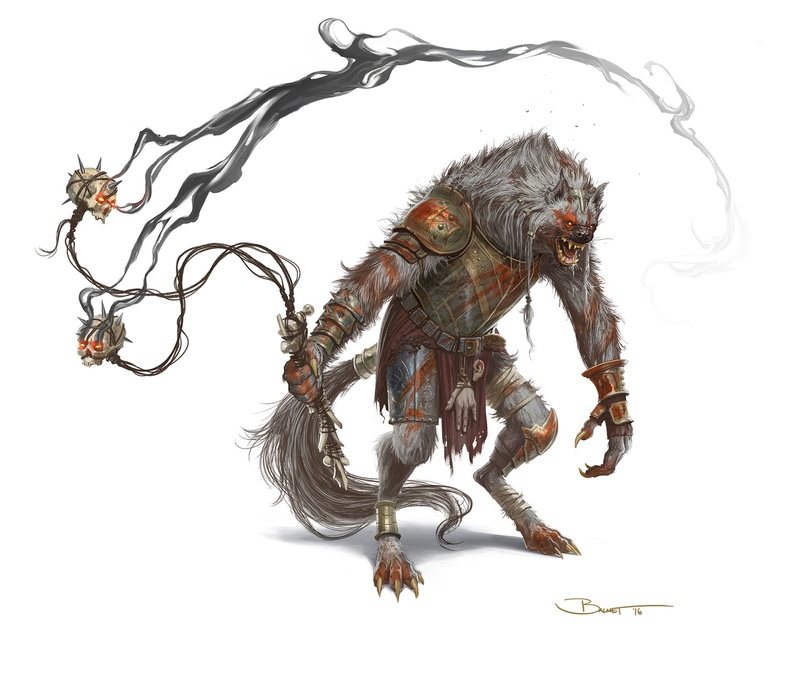 After three editions of development and increasing nuance and playability, Gnolls and Flinds are now back where they were in the days of AD&D, and for no good reason and to no advantage. They once again overlap with Orcs and goblinoids, and have even heavier overlap with lesser demons than previously. To say that this is a disappointing turn of events is an understatement. Drawing on the full spectrum of works produced about Gnolls and Flinds, and placing their current “full demon” background on the side, an interesting and complex history and set of cultural narratives emerge. What I’m presenting here is a combination of lore and speculation that is Forgotten Realms specific but adaptable to other settings. In the deep past, before the rise of humans or elves, Gnolls were created by an unknown or forgotten creator race or god. Early in their development, they divided into two populations (Gnoll and Flind), and came under the sway of Gorellik, a lesser god who took the form of a hyaenodon and taught Gnolls to tame hyenas and how to hunt, and likely “gifted” his favoured hunters with lycanthropy to become Ghuuna. Gorellik was an ineffectual god though, violent, short sighted, and too focused on his own adulation to lead or guide his “people”. These weaknesses would be his undoing and the doom of the majority of the Gnoll peoples. Even before the war against the avian Aeaee-Kocra (the forerunners of the modern Aarakocra), Gorellik was losing followers to the gods of the Giants. The war exacerbated the drift, as the limited magics Gorellik offered were no match for the arcane and divine magics of their enemies, or for the wyverns they used to wage war. Driven from their lands and facing possible extinction, some tribe, somewhere, turned to the Abyss for aid. Yeenoghu answered the call, and the doom of the Gnolls began. Now, this is pure speculation, but given how demons work, I think it’s a likely scenario. Yeenoghu was a “demon lord” in the sense that a Ford Mustang is a “sports car”. He was in a crappy part of a crappy layer of the Abyss, with no followers of note and whose only real claim to fame was subjugating a demon lord of ghouls. He needed worshipers. Gnolls fit the bill, so he changed himself to match the hyenafolk and snagged his first tribe. Unlike their previous shamans of Gorellik, the perverted clerics of Yeenoghu has serious magic, and could command and create the undead. Within a short time, Yeengohu was leading a significant segment of the population. Now, any good story like this needs some high magic and awfulness, so here’s my take. Yeenoghu wanted to subjugate the entire Gnoll species, but that pesky freewill thing was preventing him, not to mention that leaders of the most powerful tribes could recognize the dangers of demonic association. So he developed a cannibalistic ritual to ensnare the remaining population, and then played on their pack culture by openly challenging the champions of the remaining three free tribes (Gnolls, Flinds, and Ghuuna). Through deceit and trickery, he defeated the champions, fashioned their skulls into the heads of a flail, and led the ritual where the tribes were forced to consume part of their fallen champion. It was about as ingenious as a C list demon lord could get, and it almost succeeded completely. Unbeknownst to Yeenoghu, the tribes suspected trickery, and sent many of their number into the wilds and towards the lands of the Giants. This left the ritual incomplete, and robbed Yeenoghu of his ultimate success. It also meant that his grip on the Gnolls was tenuous, under the right circumstances, they can throw off his influences. To fight this, Yeenoghu has created a complex mythology for his clergy to use, placing him as the creator of the Gnolls, reworking their history to aggrandize himself, even as he used demonic magics to warp the bodies of the Gnolls and Flinds in his service into forms more pleasing to his eye. He also broke the social structures they had, and replaced them with his own, enslaving females to the males, and instituting other “reforms” designed to keep them in a state of permanent chaos. Yeenoghu has since catapulted from a minor demon lord to one that can challenge Baphomet. So, this is where it gets really fun. For the purposes of this, I’m dividing the race into two subgroups, Gnolls and Hyaenafolk. This is mostly me here, interpreting and modifying the information gleaned into something fun. For the purposes of this, the stat blocks for Gnolls and Flinds are unaltered, no matter which side they fall on. Gnolls are the monsters we are all familiar with. They’re bestial, savage, remorseless killers with no redeeming features that aren’t related to doing violence. They live in the thrall of Yeenoghu, and bear his marks, the most notable of which are digitigrade legs. In this group, there are two predominant organizations, the pack and the war band. Packs are the “breeding places”, raiding and moving just enough to keep positive population growth until the mix of Flinds and Gnolls is right to split off a war band. Gnoll packs are the most commonly encountered organization of Gnolls encountered by adventurers. Gnoll war bands are the stuff of nightmares. At their weakest, they are dangerous; at their strongest, they include multiple forms of undead and demonic allies in addition to powerful Gnoll and Flind warriors and clerics. War bands that are not destroyed in their early stages grow rapidly with each success, attracting more Gnolls, Flinds, and aid from their demonic lord. They also begin to generate kryshtantel (savage souls in the Abyssal tongue), human and demihuman slaves who become Gnolls in spirit and soul, embracing the savagery of their captors. Left unchecked, powerful war bands will eventually gain enough power and faith to generate a gate to allow Yeenoghu to enter the world, elevating them to a continental if not global threat. Gnoll social structure is decidedly brutal and patriarchal, with female Gnolls being barely above the non-Gnoll slaves. Flinds are regarded as leaders regardless of their gender, and are feared by the Gnolls for their ferocity. Flinds, when not leading, keep to themselves, disdaining the company of the Gnolls they lead. Gnolls are talk from infancy to fear the Flinds, and likewise, Flinds are taught that no brutality is too much to inflict on a Gnoll. The priests of Yeenoghu ensure this continues. To further his aims, Yeenoghu allows his Gnolls to work as mercenaries for evil organizations and individuals, to allow them to gain familiarity with the ways and tactics of the peoples they will one day destroy and consume. Gnolls, Flinds, hyenas, slaves, Half-Gnolls (abomination), Teiflings (Yeenoghu), ghouls, and kryshtantels. Gnolls, Flinds, hyenas, slaves, Hyunid (Half-Gnoll, abomination), Teiflings (Yeenoghu), kryshtantels, marrashi (winged demon Gnolls that spread plague), witherlings (undead Gnoll creations), ghouls, and shoosuva (undead hyaenodon demons). Cleric, Fighter, Ranger, and Warlock (fiendish pact only). Yeenoghu prohibits the practice of arcane magic among his followers, with the exception of Warlocks who make a pact with him. Arcane magic is not something he can control, so he prohibits it as a taboo. Hyaenafolk are the remnants of the original people that Yeenoghu enslaved. 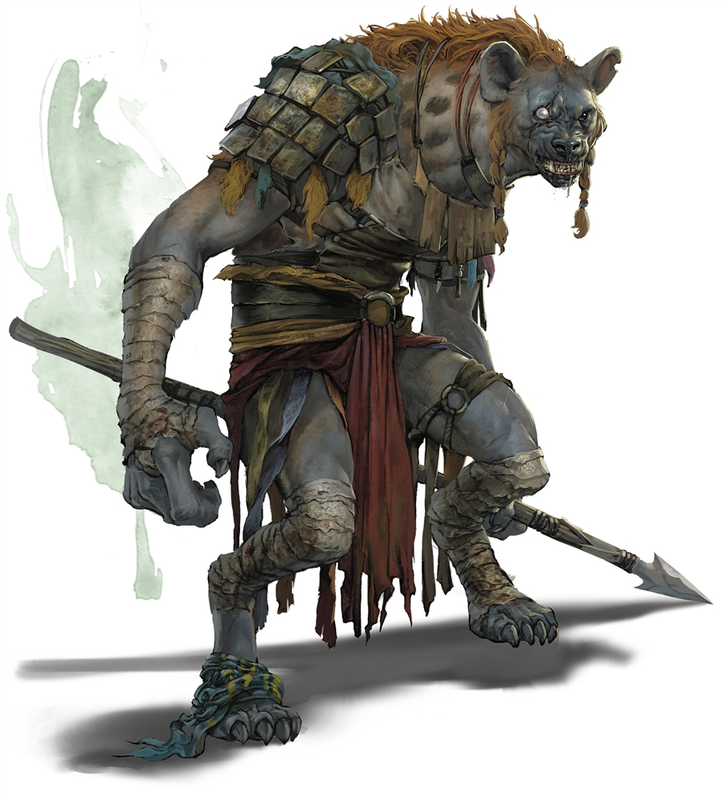 They make up less than 15% of the Gnoll population in total, and survive largely because Yeenoghu’s Gnolls lack the organizational ability to hunt them down, and because they stay to themselves, only occasionally encountering an Orc or Human barbarian tribe. 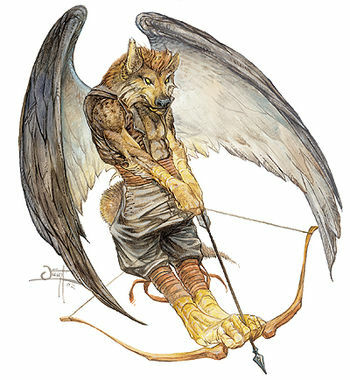 Hyaenafolk are distinctive from Gnolls in that they have less bestial features, and have plantigrade (or “human”) legs. Hyaenafolk packs may include Gnolls, however, having rejected Yeenoghu, any offspring those Gnolls have will appear as Hyaenafolk. Rituals of cleansing can also alter them back to looking like Hyaenafolk, but these are difficult to do and can only be done at certain times of the year. Hyaenafolk are generally more technologically sophisticated and conventionally advanced than Gnolls. Organizationally, they differ from Gnolls greatly, particularly in that they seldom live together. Spotted Hyaenafolk (Gnolls) are matriarchal, and show some sexual dimorphism between males and females, with the females being larger and more physically powerful. Brown Hyaenafolk (Flinds) show little sexual dimorphism and are more egalitarian, they have also developed more settled life ways. Ghuuna show little sexual dimorphism, and are generally more solitary, joining and leaving other groups of Hyaenafolk, and seldom forming groups larger than a small pack for a short period of time. Hyaenafolk do not keep slaves, but their packs and villages will sometimes have Human, Orc, or Wild Elf members from the local barbarian tribes. Hyaenafolk are still very much a primal people, and prize instincts and strength, much like the barbarians they live near. Brown Hyaenafolk are still regarded as leaders, and they have significantly less disdain for their spotted kin. Hyaenafolk social structure is more organized and less chaotic than that of Gnolls, and has been a major contributing factor to their long term survival. Hyaenafolk have a few followers of Gorellik left, but since his death at the hands of Yeenoghu, other gods have stepped in. In conventional D&D (as established in 3.5e), if they choose to follow gods, Obad-Hai, Kord, and Llerg lead the way, with Beltar and Melora following close behind. In the Forgotten Realms, Silvanus, Tempus, and Uthgar are popular, while Malar has usurped Gorellik’s empty place and is seeking to try to take the remaining Hyaenafolk as his own. Nobanion is growing in popularity in the south. Demon and devil worship is anathema, and discovery or it, or pacts with fiendish or infernal powers, is a fast way to get killed by Hyaenafolk of any world. This extends to visitors as well. Evidence of Yeenoghu’s favour or blood garners an even swifter response. Spotted and Brown Hyaenafolk (Gnolls and Flinds), Ghuuna, hyenas, hyaenodons, Hyunids (Half-Gnolls, true), and non-Hyaenafolk pack members (barbarian Humans, Orcs, and Wild Elves). Hyaenafolk have no particular taboos against arcane magic, but lack wizardry in their culture. Warlocks are extremely suspect at all times, and fiendish or infernal pact ones are killed on identification. Divine magic is relatively common, but done by druidic magics or divine sorcery instead of by clerics. 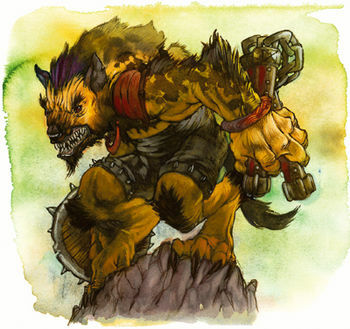 Myth: Gnolls were created by Yeenoghu, when hyenas following him ate his kills and spontaneously transformed into Gnolls. Reality: This is the official Yeenoghu Mythology ™ propaganda. The actual creator of the Gnolls is unknown, although Yeenoghu is directly responsible for their current appearance. Myth: Gnolls once had the ability to transform into hyaenodons, but angered Yeenoghu, who took this power from them. Reality: Gorellik gifted several Gnoll bloodlines this ability via a kind of lycanthropy, none of these bloodlines have survived to the present day in Gnoll populations loyal to Yeenoghu, and he has been unable to replicate the effect. Yeenoghu’s clerics have orders to slay any Ghuuna they encounter as a blasphemy against Yeenoghu’s rule. Myth: Gnolls are only as strong as their Flind. Reality: Flinds are a two edged sword; they can either reinforce or degrade Yeenoghu’s power and influence. Those who reinforce it, if slain in the presence of their Gnoll minions, cause a ripple of doubt and moment of lucidity in the Gnolls, who may then flee. Those who degrade it are hunted secretly as heretics by the priesthood, as they can lead entire packs from Yeenoghu’s service. Myth: There is a lost tribe of Gnolls, who were snatched away when the earth broke and the stars changed, forever denying Yeenoghu his bounty. Reality: This is a deep cultural memory of the Aardfolk (Aardwolf Gnolls), who were on the landmass that would become Katashaka. Unbeknownst to Yeenoghu (and Gnolls in general), the Aardfolk have survived and are their own civilization. They were torn away from Faerûn while Yeenoghu was conquering the weaker tribes. Smaller and more “delicate” than Gnolls, they are powerful magic users and noted for their scouts and hyaenodon cavalry. They are known as the Watufisi there. Hyunid (abomination): demonic forces corrupt everything, and these wretched creatures are proof of that. 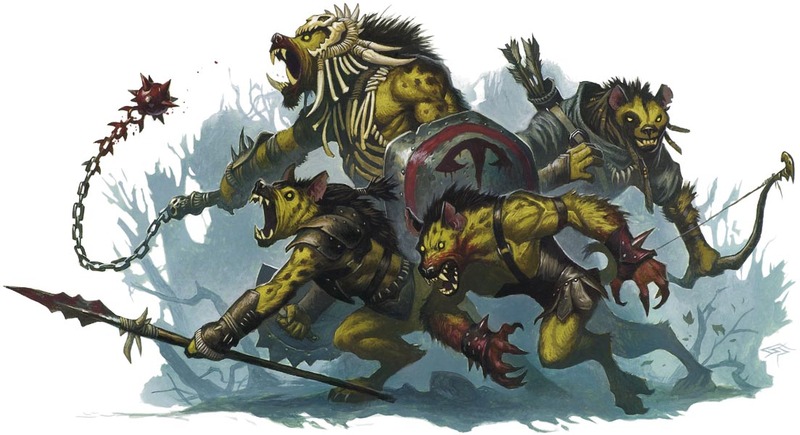 Hulking brutes, they appear to be smaller Gnolls with a patchwork of Human (or more rarely, Orcish) features on a Hyena’s head and body with patchy fur and bald spots. Their muzzles end in “Human” noses, and their lips are Human as well. Their hands are hideous, clawed things, and they are treated as fodder in battle, and as breeding stock to create Teiflings owing to their demonic corruption. Their lives are typically very short and violent from start to end. Hyunid (true): these rare people are the offspring of Hyaenafolk and Humans, Orcs, or most rarely, Wild Elves. They appear as smaller Hyaenafolk, but with generally human/orcish/elvish facial features with a hyena-like ferality, and long hyena ears. They have a light coat of fur, and strong claws. Most notably, they all have powerful, sharp teeth and a strong appetite for meat. They often act as intermediaries between Hyaenafolk and new groups of people, as they do not immediately draw hostility the way that Hyaenafolk often do. Teifling (Yeenoghu): These Teiflings display the marks of their insidious bloodline in such a way that they deviate from the norm associated with Teiflings. They are supernaturally thin, with hyena-like features and powerful jaws filled with sharp teeth and too-wide smiles. Their have short, bushy tails, clawed hands, and yellow eyes. Their skin has mottling that reflects the colouration of spotted hyenas, but they have no fur (save for their tails). They have wild manes of black hair, and seem too tall for their slimness. They are always hungry, and have strong cannibalistic tendencies. This is by no means a comprehensive, or even fully canonical (if that’s what you’re looking for), approach to Gnolls, my favourite underappreciated, under-loved monster/optional player race. I may expand on this more in future, but that’s it for Gnolls right now! All images used in this post are property of Wizards of the Coast.